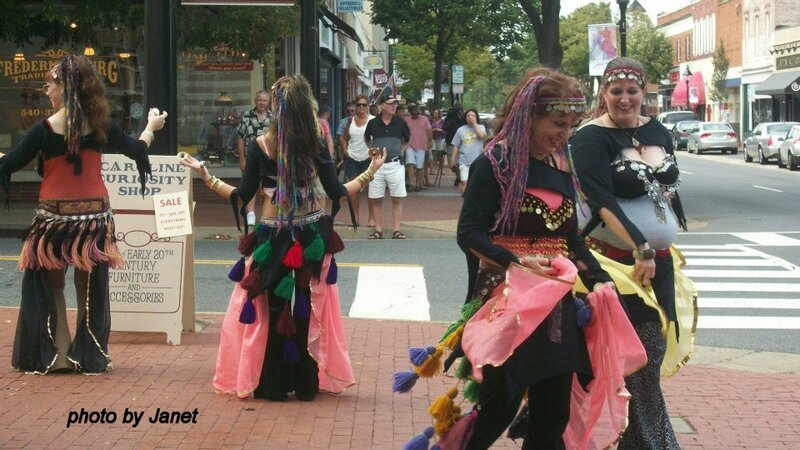 tribal skirt combinations… without a skirt! We all love the thrill of new costuming! When my performing group had two shows coming up featuring TOBD, I wanted to change up our look, just for fun. Basically, I wanted us to wear pants instead of skirts! Well, we always wear pants under our skirts, but I mean costume pants like Melodias or something similar – NOT those blasted “harem pants” that I loathe like the devil. So good, we’ll wear pants. 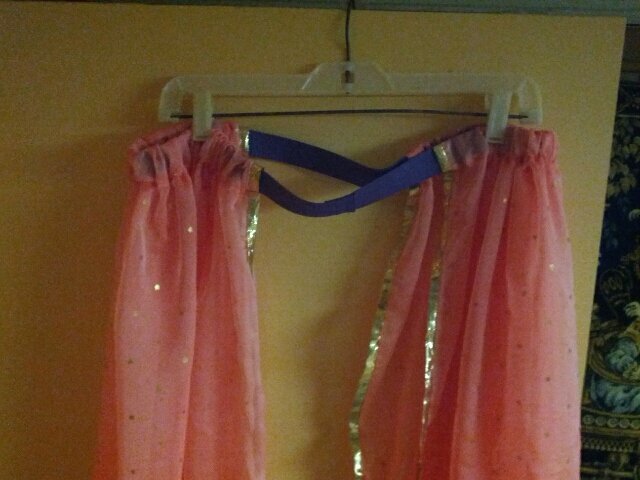 The problem is, we have lots of Skirt Combinations I wanted us to be able to do when we’re dancing. So the idea came to me to re-purpose some small circular veils I have but don’t use very much. Now, these aren’t any old kind of veil, these are rounded rectangles with gold ribbon trim – similar to the veils we typically use for Tribal Odyssey veil dancing, but smaller. 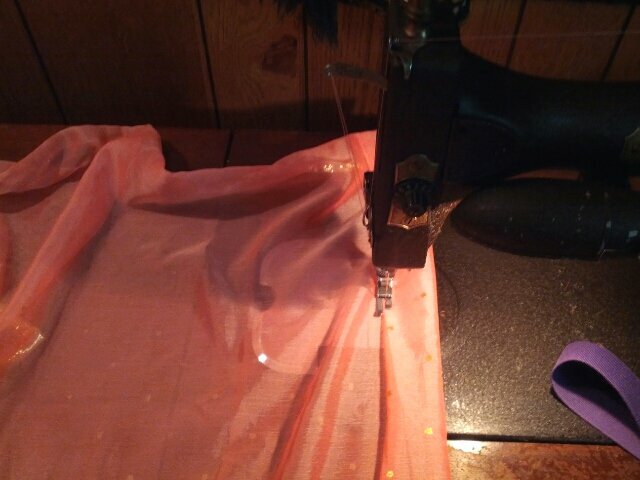 The fabric has a nice weight to it, a bit heavier than chiffon but I’m not sure what it is, perhaps organza. 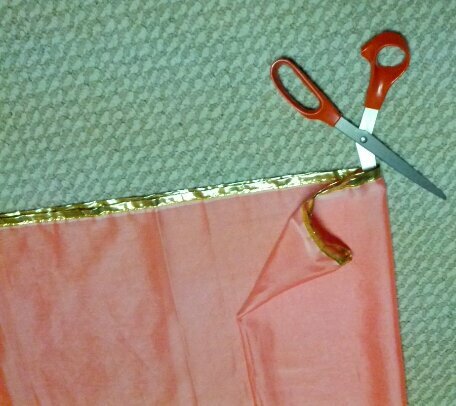 After I cut along the fold, the leftover material will make a scarf. The panels would’ve been too long if I didn’t take those 5 inches off. 2. Can you believe some people don’t know what a casing is? That’s okay! The casing is where the elastic goes. (I always use elastic, I HATE drawstrings!) The edge that I just cut is now folded over and sewn, which forms the casing. 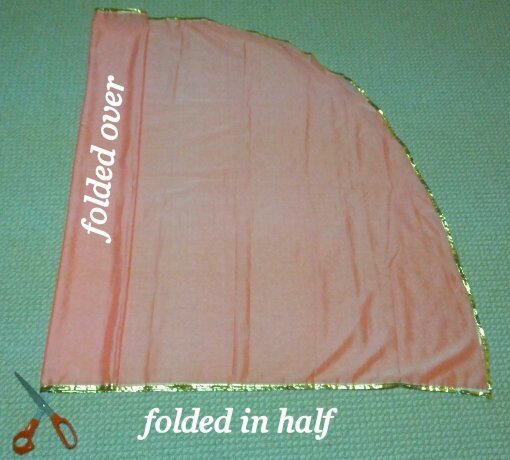 Folding over twice will keep the cut edge from fraying. sewing is easy – you can do it! 3. See the purple elastic? Just make sure your casing is wide enough for the elastic to fit in easily. Attach a large safety pin to one end of your elastic (which should be cut to fit snugly around your hips) so you can slide it easily through the casing from one end to the other, making sure the “right side” of the material is facing out (so you don’t have one panel inside-out). Sew the ends of the elastic together. now it’s starting to make sense! That was easy, right? The straight edge goes in front, and the curved edges go in back, at least – that’s how I like it. I think they rock! What do you think? we’re dancing in separate duets here. the duet on the right is getting ready to do skirt combos (and yes they’re wearing finger cymbals)! Well, since you ask me what I think 🙂 I think it is a solid alternative to the usual panels. I am wondering what it would look like with an entire veil on each side, or maybe even an entire veil with the top folded over for the casing but NOT cut off. The veils you used look stiffer (organza); a softer fabric might be called for if going for the whole -veil-each-side else the effect would more be sugar-plum-fairy.